For some people, they are the start of another new, exciting adventure. For others, they are the beginning of another long, dreary, 7-day stretch. The truth is, Monday mornings are filled with opportunities for growth and new accomplishments. They are the start to another 7-day chance to invest in what matters most. My view of Monday mornings isn’t just a hopeful wish. There are certain practices I follow that allow me to start each week right. What follows are 5 keys to success for Monday mornings that, when practiced, will allow you to live it forward at the beginning of each week. These 5 keys to success allow me to grow personally, invest well in the lives of my family, serve my community, and add value to my clients. 1. Pop Up. One of the keys to success for Monday mornings is to “pop up” out of bed and get an early start. Rolling out of bed at 8 or 9 AM keeps us for getting a head start to our week. Getting up at 5 or 6 AM in order to hit the ground running is one of the most important keys to success for starting our week off right. 2. Purpose. One of the reasons I want to pop up and get an early start is so I can reconnect with my purpose. I’m using “purpose” here in the broadest manner possible, so I’m not only talking about reconnecting with my life’s purpose statement. I’m also talking about reconnecting with my values and goals as well. The way I do this comprehensive reconnect is through a discipline I call leading my life from quiet. 3. Positive. While leading my life from quiet, I pay special attention to my attitude. I focus on creating an optimistic, positive, thankful mindset. Gratitude for life, gratitude for my blessings, and even gratitude for my problems and challenges are keys to success that allow me to take 100 percent responsibility for my life first thing on Monday morning. This attitude check is one of the keys to success that enables me to start my week off in the right frame of mind. 4. Plan. I map out my plan for the week every Monday morning as well. Some people do this Sunday evening, but I wait until Monday morning for two reasons. First, Sunday afternoon and evening is family time. I love relaxing and hanging out with my wife and kids, and I want to be fully invested in these moments without being distracted by thinking about the future. Second, since I “pop up” early on Monday morning, I have plenty time to plan out what’s I need to focus on during the upcoming week. 5. Proactive Priorities. When I plan out my week, I don’t create a To-Do List. I create a Goal-Getting list that includes what I call 20 Percent Activities and 1 Percent Activities. This list is based on the Pareto Principle and is core to the system I use to set and achieve goals. This Goal-Getting system is one of the best keys to success I embrace because it empowers me to proactively focus on the priorities that matter most to me. Question: How are you starting off your week? 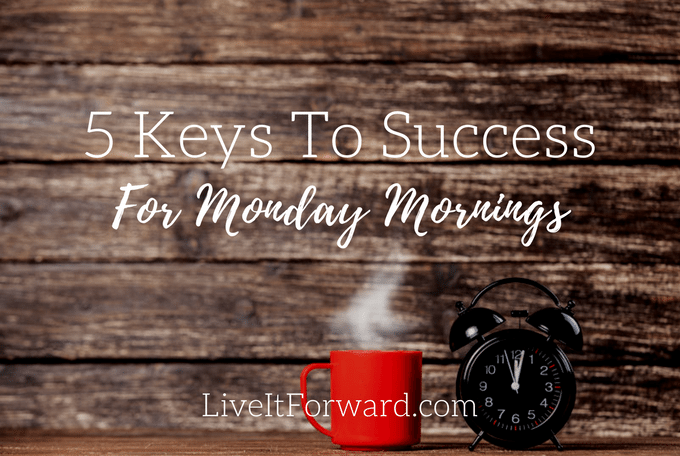 Are you practicing the 5 keys to success for Monday mornings?